*Rates are net. No discounts offered. Your ad should be submitted as a high-quality PDF for good, sharp results in print. Whatever program you use, choose the highest-quality setting, like X-1a or "press quality." If your program doesn't offer a PDF setting for professional printing, you may be disappointed in the results. To get a professional result you may need professional design services. We can also accept your original ad design document if it was created using Adobe InDesign, Photoshop and Illustrator. Supporting files/fonts must be included for InDesign files; Photoshop files should be created at a minimum resolution of 300 dpi; if sending an Illustrator file please outline all fonts. We CANNOT accept Word documents, Publisher files, or any others from programs not listed above. Ads can also be submitted in the following graphic formats: EPS, JPEG, and TIFF. Please convert color mode to CMYK. JPEG and TIFF files should be created at a resolution of at least 300 dpi. Lower resolution than 300 dpi will result in poor quality images and jagged text. For best possible results include a printed proof of how your ad should look. Please note: ATA reserves the right to reject an ad if its quality is poor. It is the responsibility of the advertiser to submit a high-quality ad for The American Trakehner. Images submitted for articles, show results, ads, etc. must have a minimum resolution of 300 dpi to properly reproduce in print. Files should be e-mailed if possible. If your file is too large, it should be sent via FTP using a service such as www.YouSendIt.com. Large files may also be sent on disk. Disks and proofs will not be returned. Please note: Final print reproduction may not exactly match your proof or screen display. We cannot guarantee reproduction of electronic media files. Design Services: Important Notice to Advertisers – Please read carefully! Newsletter: Materials due to Helen Gibble before the due date for editorial material printed in each newsletter. Ads may be submitted in the following formats: JPEG, GIF, PDF or Word. $50/month for ATA members or $100/month for non-members. Special Introductory Rate: Buy your first month, get your second month FREE! 300 pixels wide x 250 pixels tall - located on the right side of the page under the page header bar. Ads may be submitted in the following graphic formats: JPEG, GIF, PDF or PNG. Graphic files should be sized for fast web display and be less than 50 kb. Please note: ATA reserves the right to reject an ad if its quality is poor. 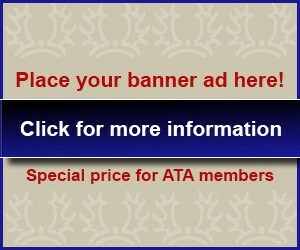 It is the responsibility of the advertiser to submit a high-quality ad for The American Trakehner Association website. All banner ads can by hyperlinked to advertiser’s website or email - please specify in your advertisement request. Please note: Final reproduction may not exactly match your proof or screen display. We cannot guarantee reproduction of electronic media files. Design services are not available through the ATA, however Anna Goebel is offering banner design assistance at Freestyle Graphic Design. All Advertising must be “Paid In Advance”. Make checks payable to: American Trakehner Association.